The Third Discovery of the Venerable Head of the Holy Prophet, Fore-Runner and Baptist of the Lord John occurred in about the year 850 (the account about the First and Second Discoveries is located under 24 February). During the time of unrest at Constantinople connected with the exile of Sainted John Chrysostom (Comm. 13 November), the head of Saint John the Fore-Runner was found in the city of Emesia. 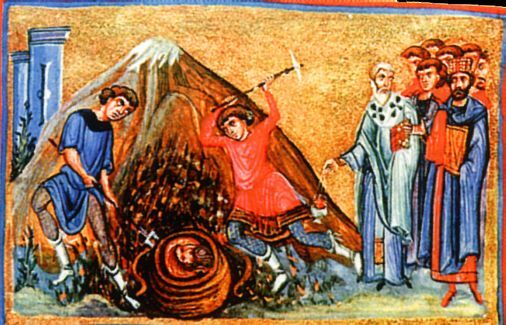 It was transferred from there during the time of Saracen raids (about 820-820) to Komana and there – during a period of iconoclast persecution, it was hidden in the ground. When the veneration of icons was restored, Patriarch Ignatios (847-857) during the time of prayer at night was shown in a vision the place, where the head of Saint John the Fore-Runner was concealed. The hierarch communicated this to the emperor, who dispatched a delegation to Komana, and there the head was found a third time at the place decreed by the patriarch in about the year 850. Afterwards the head was again transferred to Constantinople, and here on 25 May it was placed in a church at the court. Part of the head is located at Athos. In memory of the Third Discovery of the Head of the Baptist of the Lord John, the celebration is on 25 May.